Curator Naomi Speakman explores the fantastical world of medieval bestiaries and the mythical creatures found within. A griffin on a bookbinder's stamp. Possibly French, c. 1150–1200. A bestiary is a kind of encyclopedia featuring a compilation of descriptions of animals, beasts – and sometimes even rocks. In England, they were particularly popular in the 12th and 13th centuries, and drew their origins from classical literature such as the work of Pliny the Elder and a Greek text from the AD 300s called the Physiologus. The descriptions also provided symbolic and moral stories alongside explanations of the creatures. Alongside real animals such as lions, swans and bears, there are mythical animals such as the phoenix and basilisk. The importance of the world as created by God is underscored in bestiaries. A common layout of the bestiary is to open with God creating the earth and the animals. Animals can be grouped in different ways in bestiaries, either by their moralisations detailed in their descriptions or by their physical descriptions. Although few people actually read bestiaries, many more would have recognised the animals, which were found on different types of objects, from sculpture and floor tiles to dress accessories. We can find some of these in the British Museum’s medieval collection. Pin topped with the head of a unicorn. 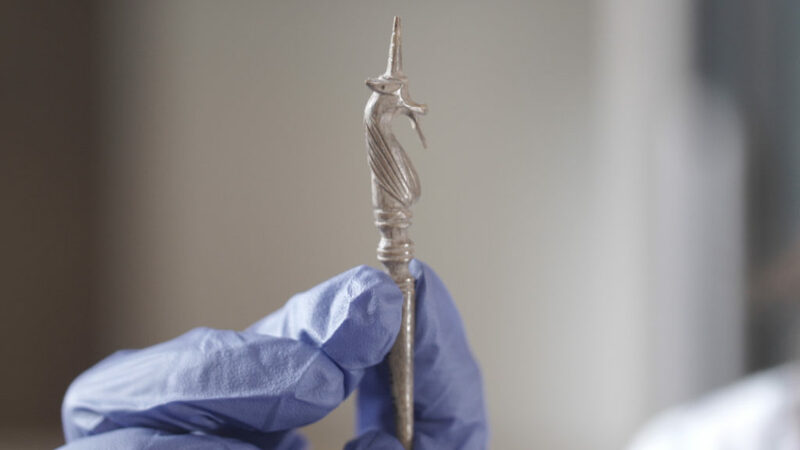 This tiny pin is made of bone and is topped with the head of a unicorn. It matches the medieval description of the animal, as a horse-like beast with a long, straight horn protruding from its head. As on other examples, the horn has a twisted spiral running along its length. This particular unicorn also has a tiny beard. It was found in the 19th century in Bucklersbury, a road in the City of London nearby to Cheapside. Pliny the Elder described the unicorn as, ‘the fiercest animal, and it is said that it is impossible to catch one alive.’ The only way to catch one would be to tame it by bringing it into contact with a virgin woman. The unicorn would then lie down and fall asleep on the lap of the maiden, whereby it could be killed or caught. In popular depictions of unicorns they will be in this position, asleep or resting with a spear plunged into them or with a hunter approaching. The end of this casket, which is on display in Room 40, shows this moment of capture and death. 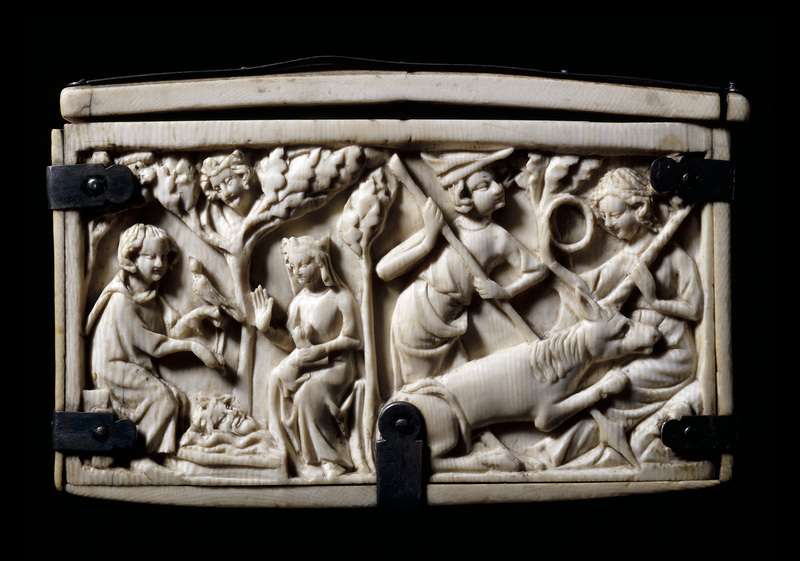 Ivory casket featuring the death of a unicorn. Made in Paris, c. 1325–1350. The story of the unicorn was an allegory of Christ’s incarnation and it is suggested that the horn of the unicorn represents the unity of Christ and the Holy Father. The horn was recommended as a cure for poison and the horn had purifying properties. A beast which was not associated with purity was the centaur, half man and half animal, the upper body being the human part and the lower portion that of a horse-like creature. The centaur was a symbolic beast, as his human front concealed that he was also an animal. 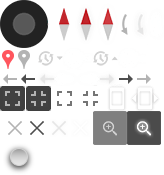 It is governed by its animal (rather than its Christian, human) self and as a result its image was tied to lust and sin. 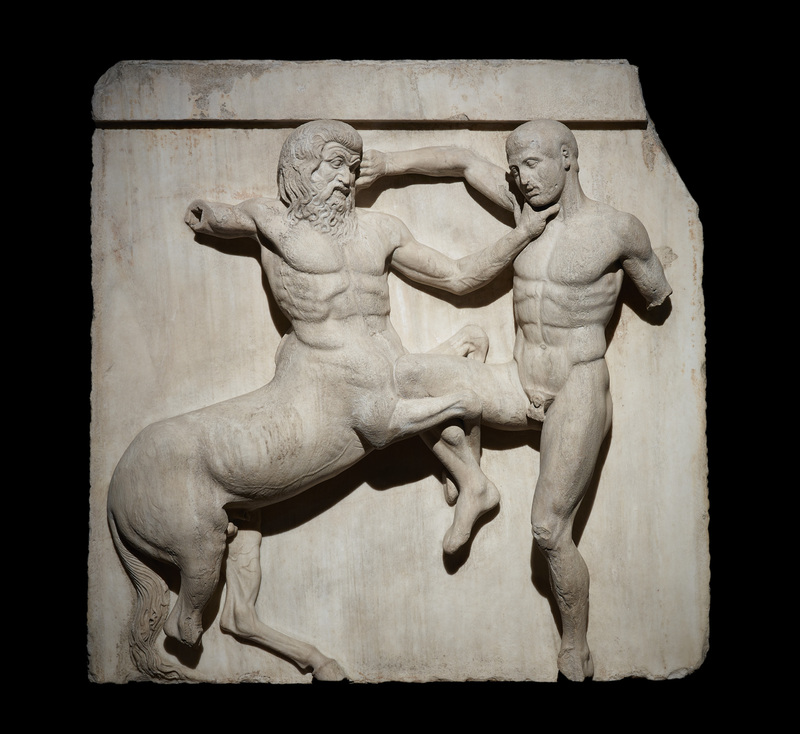 Metope from the Parthenon showing a Centaur and Lapith fighting. Athens, 447–438 BC. The unbridled passion of the centaur was illustrated by the battle of the Lapiths and the Centaurs at the wedding of Pirithous and Hippodamia in Greek mythology. As well as featuring on a metope of the Parthenon, this violent event was portrayed on a marble relief designed by , made around 1492. Centaurs also accompany sirens in some depictions, half women half birds, who were also associated with ideas of lust. A more courtly centaur is depicted on this 13th-century German candlestick. His hind quarters are that of a horse, his two back feet take the form of hooves, and a hole in his back would have held the candle. Oddly, he appears to have human feet at the front. Although his right foot is damaged, on his left is clearly a tapered shoe with gathered bands at the ankle. He wears a tunic on his torso and a hood which terminates in a point on both sides. In his left hand he holds a stringed instrument called a rebec. Another example of a hooded centaur playing music can be found on this wooden carving on a misericord from the choir stalls of New College, Oxford – a clothed centaur plays a pipe and bangs a tabor. The griffin, with the head and wings of an eagle and the body of a lion, was popular in heraldry and is frequently incorporated into coats of arms depicted with one foot or claw raised. It stands in this way on a bookbinder’s stamp from about 1150–1200. A griffin on a bookbinder’s stamp. Possibly French, c. 1150–1200. Collections of legends telling the exploits of Alexander the Great, first written in the 4th century, known as The Alexander Romances, tell of Alexander carried up to the heavens in a chariot pulled by griffins. You can find depictions of this story in England on a number of misericords at Wells, Gloucester and Lincoln Cathedral. 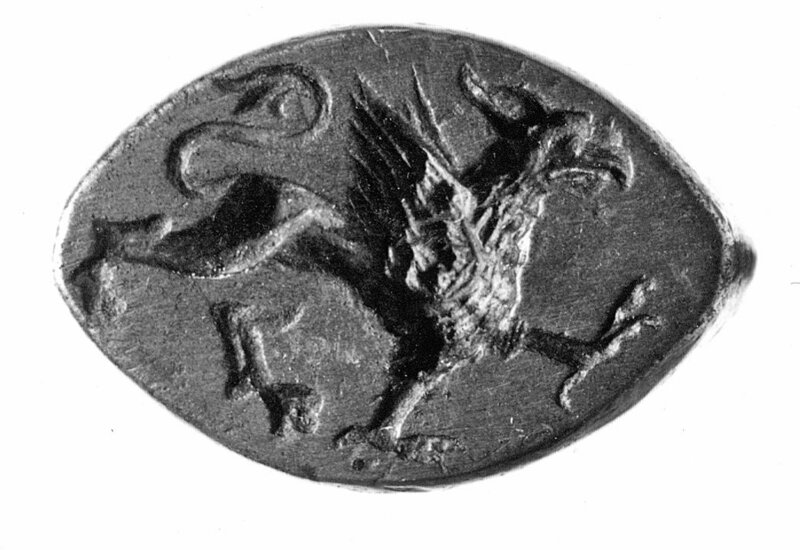 Griffins are also depicted fighting other animals such as lions. Writing in the 7th century, Isidore of Seville said that griffins are hostile to both humans and horses. As a combination of both lion and eagle, two regal animals of their own kind, griffins have associations with royalty. You can find some of these fantastic beasts in the Sir Paul and Lady Ruddock Gallery of Medieval Europe 1050–1500 (Room 40), including a stone capital carved with a lion and a griffin and the casket engraved with the capture of a unicorn.